A career scientist of exceptional merit, 29 year old Dr Helen Green is the recipient of a major 5-year Research Fellowship. 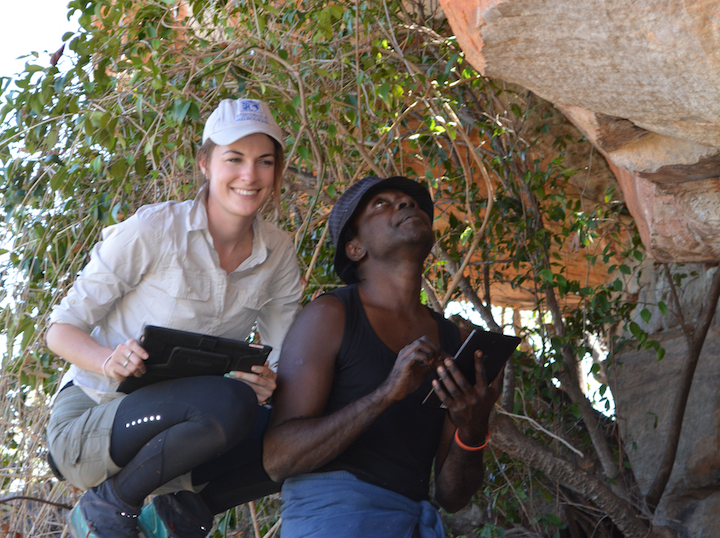 Helen is a post-doctoral scientist at The University of Melbourne and a member of the KFA’s Rock Art Dating project research team. Dr Helen Green and Ian Waina July 2018. The new $740,000 Kimberley Foundation Australia Fellowship in Rock Art Dating is funded $600k by The Ian Potter Foundation and $140k by KFA over a 5-year period which commenced in March this year. 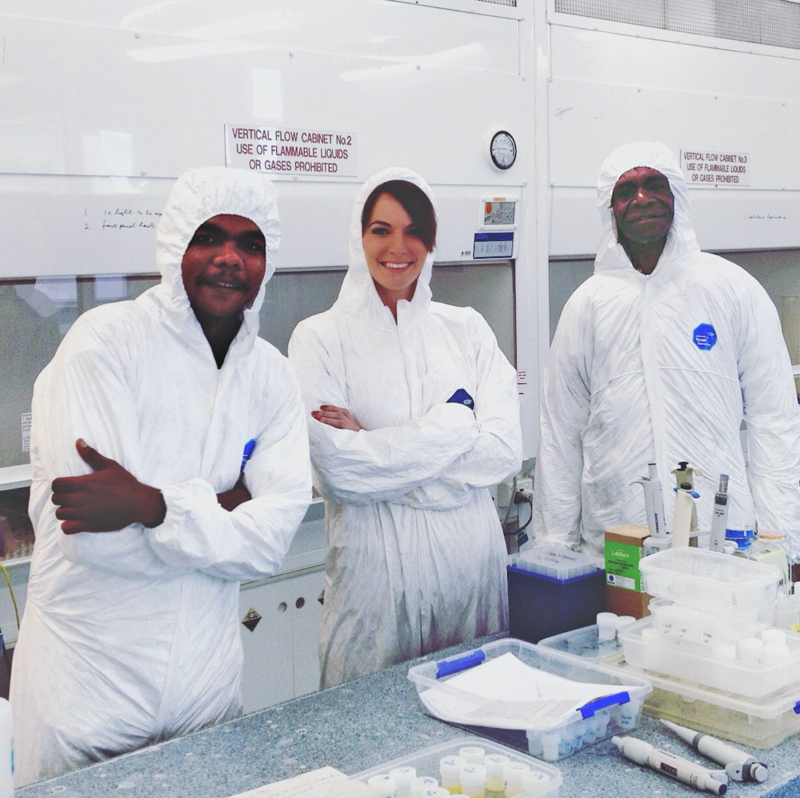 The Fellowship was awarded to Dr Green to enable her to contribute to the multi-disciplinary project investigating the history of human origins in Australia and indigenous cultures in the Kimberley known as the Rock Art Dating project. Rock Art Dating 2 is funded separately by KFA and the Australian Research Council for a cash total of $1.3 million over a four year period. Helen’s breakthrough work on uranium series dating attracted the support of the KFA and The Ian Potter Foundation. Helen was examining the characteristics of complex mineral systems present in Kimberley rock art shelters which make them conducive to radiogenic dating. Her research focuses on characterising and dating the mineral accretions or ‘crusts’ that fringe or are inter-layered with the rock art panels. Using an advanced mass spectrometer, she can measure amounts of Thorium accumulated from the decay of Uranium in the samples collected and uses this to calculate the age of the mineral deposit. Occasionally, these crusts are found under and/or over pigment allowing her to provide maximum and minimum bracketing ages for the associated paintings. Helen is using new state of the art facilities available at the University of Melbourne’s Earth Science laboratories including laser ablation dating on targeted, uranium bearing mineral layers. A new mass spectrometer just installed provides the increased sensitivity required to measure much smaller samples, ultimately allowing for increased efficiency and reliability in the uranium-series dating application. With each subsequent visit to the Kimberley Helen fine-tunes the processes both on site and back in the laboratory and she has also developed an eye for the mineral accretions that might yield the best results. Working in a team of three, an archaeologist/recorder, indigenous representative/ Traditional Owner and a scientist, the sites are carefully recorded and documented. Each sample taken is recorded with meticulous care into the project database with a detailed set of photos and information regarding the motifs. With up to 20 sites and 100 to 150 samples collected each field trip the accurate recording of data is essential. Helen works closely with the Traditional Land Owners, the Balanggarra Aboriginal Corporation and the Rock Art Dating team at The University of Melbourne, led by Prof Andrew Gleadow, and other colleagues including ARC Laureate Prof Jon Woodhead and Prof Janet Hergt as well as Drs John Hellstrom and John Moreau. The team is also closely supported in their research by the rock art archaeology team from UWA led by Prof Peter Veth. The five-year Fellowship ends in 2023. Dr Helen Green, Drysdale National Park.